Some of the most difficult things we face in our field are those things which are intangible. One of the most damaging to our students and possible our sense of purpose as educators is that our students must somehow prove themselves, repeatedly, to show they are capable, competent and are acting with intentionality when they attempt to communicate be it through language, AAC or behavior. We live in a land of pre-requisites and accountability, which leaves little room for "The Least Dangerous Assumption" as pioneered by Anne Donnellan in 1984 and clarified by Rosetti and Tashie. The least dangerous assumption is, of course, the premise that (in the absence of evidence) we believe we not yet found a way to make it so a child or adult with a disability "can" instead of believing he or she "can't". Let's take, for example, a child who at age ten is presumed to be functioning at "a 6 month level" in spite of the difficulty of truly measuring the capabilities of an individual who moves only his eyes and tongue, communicates only through moaning vocalization, sleeps most of the school day and does not live in an English speaking home. While it may be true that this individual has significant developmental delays it also may be true that this child does NOT have significant developmental delays. When we choose not to accept the premise of severe cognitive disability and instead begin to form a relationship with the child, build trust in that relationship, respond to eye, tongue and vocalizations as if they are intentional and then introduce assistive technology we may find that this individual in fact is at grade level. This is a true story and it turned out that little boy was, indeed, not developmentally delayed, and one has to wonder how many stories are out there are there where individuals are capable of so much more than is being presumed of them. Even if it were just that this little boy functioned three, six or 24 months higher developmentally than his initial evaluation suspected it would have been a triumph of "the least dangerous assumption". The child would have been given the gift that presuming competence creates. And what a marvelous gift it is. StoryKit is a free iPhone/iTouch/iPad app from the International Children's Digital Library. It allows the user to create story books using multimedia including images and audio clips. Integrated into the program is a paint program and ability to share books you make. You can use this app to create scrapbooks of recent classroom events, social stories and visual schedules. Essentially you are limited only by your creativity. If you download the free ARASAAC or Scelera Picture Symbol (or the Mayer-Johnson PCS Metafiles or similar) set onto your iDevice you can intergrate picture symbols into your "book". Otherwise you can use photographs you take with the camera (on an iPhone or iPad) or import through iTunes. StoryKit has the possibility to replace some of the more expensive prompting (a visual schedule could be created with one picture per "page" and audio of what happens next and a child taught to turn the page when done with each step or his helper could do that for him) or storyboard programs, so long as you aren't looking to have an alarm or timer. StoryKit also has access to the books in the International Children's Digital Library to read and share together. Using a dwell program is a way to "click" the mouse and is especially useful for use with mouse emulators, like joysticks and head or eye tracking. Recently in working with a young adult who has some significant issues with touching a touch screen or clicking a mouse to make choices (it seems to be a psychological issue along the lines of learned helplessness or desire to avoid displeasing others) a dwell option seemed to be a possible way to circumvent the issue. Judy Terranova is a 20 year old from Boston who just finished her freshman year at Salem State College. She began Salem State College under the impression that she had recieved a John and Abigail Adams Scholarship which would cover her tuition at any four year state college or university. The Adams scholarship is awarded annually to Massachusetts high school graduates who score "Advanced" in in one area of the Massachusetts Comprehensive Assessment System exam and at least "proficient" in the other as well as scoring in the top twenty-five percent of their school district on the exam. Judy's test scores were stellar and she was well over the twenty-five percent mark on her scores. However, Judy happens to fall on the autism spectrum and took an extra semester to graduate from high school (the prestigious Boston Arts Academy, a Boston Public Schools pilot school where she majored in Theatre). While no one is questioning that Judy has disabilities (for which she was on an individualized education plan and continues to receive services through the Massachusetts Rehabilitation Commission), the Massachusetts Office of Financial Assistance, who administrated the scholarship for the Massachusetts Department of Education insist that Judy did not meet the requirement of enrolling in the first traditional semester following graduation. Yet Judy did begin college the first traditional semester following graduation. Her graduation took place in February 2009 (well after spring semester began at all state colleges and universities) and she enrolled the next traditional semester which was Fall 2009. It is clear that the impact of the decision of the Massachusetts Office of Financial Assistance is discriminatory against Judy on the basis of disability. Judy required an extra semester to graduate from high school because of her disabilities and because of this her Abigail Adams Scholarship has been revoked. Additionally it seems the Office of Financial Assistance has told Judy's family that her involvement and receipt of support services from the Massachusetts Rehabilitation Commision prohibits her from receiving the scholarship she earned. This is not stated in any of the materials about the scholarship and is blatant discrimination. There is no plausible explanation for barring this young lady from this scholarship except that the Office of Financial Assistance feels that someone on the autism spectrum who has met all listed criteria for the award is not worthy because of the fact that she has a disability. 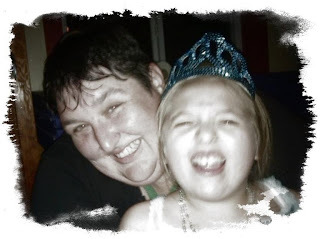 Like all individuals diagnosed on the autism spectrum Judy struggled to succeed in school. As she says, "Some of us don't learn by osmosis." She had to work hard to undertand non-verbal communication, figurative language and on organizational skills and expressing herself in writing. There were times when she wanted to give up. The second half of her junior year she had to re-take two classes at night school and the next school year took two more night school classes to be able to graduate in February. She missed out on walking across the stage to receive her diploma with her classmates, a big deal in small arts school with a focus on the "ensemble", and instead graduated nearly eight months later in a small private ceremony. Judy worked as hard, if not harder, than many for her chance at college and success, yet her scholarship was plucked away. Judy is excited to be returning to college next fall as a sophomore. First semester freshman year she even made Dean's List. Yet the Office of Financial Assistance still refuses to reconsider their decision and grant her the scholarship she earned. And insist Judy Terranova's scholarship be reinstated. The YGWYPF notation means "You get what you pay for!" This week a student and I logged onto the internet via her Tobii C-Eye to look for some images of her favorite books to put on her "my favorites page". Her default home page is set to the Tobii website and we saw the new Tobii S32 displayed. The Tobii S32 looks to be an upgrade from the old and discountined LEO from ATI (before it was Tobii ATI), as it combines recorded speech with environmental controls. Converting from the Austrialian prices it looks like the cost is about $1400 US dollars for touch only and $1870 US dollars for the scanning version and it comes with the SymbolMate software. These prices seem comparable to the AMDi Tech/Scan Pro devices (although none of them has ALL of the features of the S32). 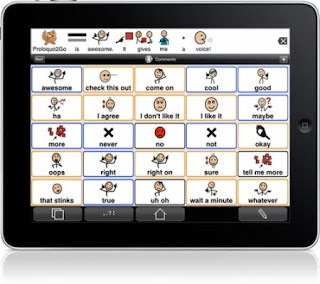 For the purposes of this blog entry internet based AAC is augmentative and alternative communication which is primarily or solely created and stored on the internet (or the "cloud"). The pros of this arrangement are that you do not need to worry about backing up as much (you still need to back up), you can program while the user is still using the speech device (be it a dedicated device or an adapted tablet PC, netbook or iPad) and you often times have access to instant sharing of materials. The cons of this arrangement are you can not count on the speech software being research based, overtime subscription fees may cost more than purchased software at the outset, more unique AAC users needs may not be met without a specially designed speech device, not all users have high speed internet access (only 65% of homes according to FCC), new companies may not be there in the long run. 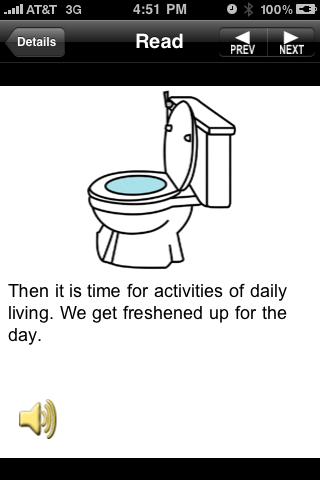 Alexicom Tech: is an internet based AAC program offering photograph and clip art symbols, SAPI 5 voices, 1-10 columns and 1-10 rows per page, page sharing and on or offline use with the program running in your web browser, it also will run on iTouch or iPhone, prices are tiered with the highest price being $40 a month and the lowest price being $23 per user per month per year. 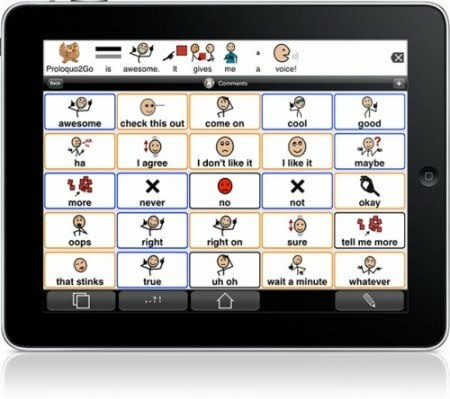 MySitris: is for literate communicators wishing to make a phone call over the internet using Sitris as augmentative/alternative communication. It is priced per minute with 50 free trial minutes. Pogo Boards: is an online communication board building program which offers SymbolStix as well as proprietary symbols and text-to-speech for online talking communication boards. There is board sharing and a very limited free trial. Their rates are tiered based on number of users and number of months/years in subscription ($9.99 a month to $129 for 3 years for 1-4 users). Vizzle: is an online program that allows interactive lesson and communication board creations, much like programs like Boardmaker Plus, Clicker 5 or Classroom Suite (only no scanning). There is little information on the picture symbols set (although it appears to be a unified set) or the voices. Prices are not listed on the site, you have to call or e-mail (annoying that). It is primarily for students with Autism, although it may be used with students with many types of disabilities. The research for Vizzle was done out of Children's Hopsital Boston, John Hopkins and the Monarch Center for Autism. They off a 14 day free trial. If you are like most teachers, especially if you are a "craft impaired" teacher, you are always looking for craft ideas that are new and different beyond the usual hand print turkey at Thanksgiving and vegetable print painting in the spring. Add these blogs to your RSS reader or just bookmark them to visit periodically for new ideas to try out. When doing crafts in your classroom you are going to want to consider all the ways you can possibly integrate assistive technology (your pouring cup for glitter, your environmental control box with a switch and a hair dryer to dry crafts or your battery operated scissors with a switch for cutting) in addition to embedding as many communication opportunities as possible (see this post). 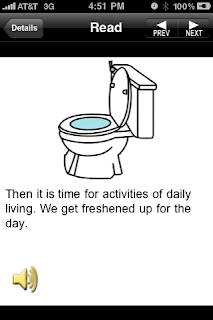 While we do our arts and crafts projects we have to be clear about our goals and objectives for the lesson and how doing the project helps students meet their IEP goals and objectives. In fact it might help to write about the child's process in completing the project on the back or on an index card attached to the project so everyone is clear. How can we answer the questions, "How is this child participating as fully as possible in ALL aspects of this project?" and "What is the purpose of this child participating in this project?"